John Cyprian Stevens, civil engineer, was born in Moline, Kansas, January 9, 1876, the son of Charles Freeman and Esther Meek (Kilgore) Stevens. His first paternal American ancestor was Cyprian Stevens, who came from England in 1660 and settled in Sudbury, Mass. His father was a minister of the Seventh Day Adventist Church. He received his preparatory education at grade and high schools in Knoxville, Iowa, and Union College, Lincoln, Nebraska, and was graduated B.S. in civil engineering at the University of Nebraska in 1905. He taught at Iowa country schools for several years and served in the Philippines during the Spanish-American war. In 1902 he was appointed assistant state engineer of Nebraska, and in the spring of 1904 was appointed assistant engineer in the U.S. Reclamation Service. He was able to complete his college work without severing his connection with the bureau, and following graduation he went to Denver, Colorado, in the interests of the bureau; then, after a year in Washington, D.C., he was transferred to Portland, Oregon, as district engineer in charge of water supply investigations In the Pacific Northwest. In 1910 he resigned from government service to engage in the practice of engineering in Portland. In 1912 he went to Spain for the Pearson Engineering Corp. In 1915-16 he was engineer in charge of the West Okanogan Valley irrigation project In the state of Washington. He then resumed private practice in Portland, In 1920 he joined with Ray B. Koon in establishing the firm of Stevens & Koon. In 1911 Mr. Stevens made a contract with Leupold & Volpel of Portland to manufacture a water level recorder of his design. He became a partner in the firm in 1915 under the name of Leupold, Volpel & Co. This was succeeded in 1940 by Leupold & Stevens Instruments, which now manufactures a great number of engineering instruments. All surveying instruments carry the name of Stevens. His published writings include papers published by the U.S. Geological Survey and numerous articles in the Transactions of the International Engineering Congress, the Engineering News-Record, Journal of the Associated Engineering Societies, Transactions of the American Society of Civil Engineers, and others. He has been a member of the Oregon State Conservation Commission, member of the committee that drafted the water code of the state, vice-chairman of the super­power survey committee of the Pacific Northwest, and consulting engineer for the Portland sea wall and intercepting sewer development project. In 1944 he was elected president of the American Society of Civil Engineers. He is also a member of the Professional Engineers of Oregon (first president in 1929), American Institute of Consulting Engineers, American Institute of Electrical Engineers, American Association of Engineers, Newcomen Society, Portland Chamber of Commerce, the Kappa Sigma, Sigma Xi, and Theta Nu Epsilon fraternities, and the Rotary and Irvington clubs of Portland. He was founder and co-author of the first ritual of Sigma Tau, honorary engineering fraternity, and endowed the J. C. Stevens Award of the American Society of Civil Engineers for the best discussion of a paper on hydraulics published in the Transactions of the Society. A C.E. degree was conferred on him by the University of Nebraska in 1928, and a Doctor of Engineering (honorary) degree by the Oregon System in 1938; also a Doctor of Engineering (honorary) degree by the University of Nebraska in 1947. For the past five years (since March 1945) Dr. Stevens has been president of the Oregon Museum Foundation. In politics he is a Republican. He was married in Lincoln, Nebraska, June 15, 1905, to Nancy, daughter of William and Margaret Ann Canning of Beatrice, Neb. They have three children: Jane Canning, who married A. Kimbrough Hackman; Martha Elizabeth, who married Donald Hay; Robert John Stevens, and an adopted grand­daughter, Nancy Lou Stevens, who married Audiss Smith of Pontiac, Michigan. 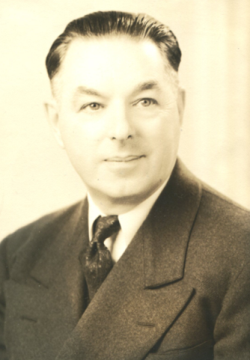 After serving OMSI as president for thirteen years to Nov. 15, 1951, he was named by the Board as President Emeritus. The J. C. Stevens Hall of Hydrodynamics was officially dedicated during the week of June 21-27, 1958. On July 1st 1953, he was hospitalized by a stroke which resulted in the loss of his ability to speak, Mrs. Stevens was also brought to the hospital, but was later released to a nursing home. She was finally brought home but died there on Nov. 5, 1953. After regaining a certain ability to speak, he remarried Ruth Newton on Feb. 12, 1954. They built a home at 6639 S. E. Yamhill Court. Their world trip is picturesquely written in The Autobiography of a Civil Engineer by John Cyprian Stevens. Kenneth Phillips was born at Fairgrove, Kansas, on September 28, 1897. In 1915 he moved with his parents to Albany, Oregon. With one year's interruption by the First World War, he was graduated from Oregon State College in 1921 in the School of Engineering. Upon graduation he began working with the United States Geological Survey, with offices in Portland, and he has continued with that branch of the service until the present time (1950). Most of his work has been within the State of Oregon, with the exception of five years during which he was stationed in Southern Oregon. He had one brief assignment in Washington for three months and one assignment of six weeks in Alaska. Since 1948, upon the retirement of George H. Canfield, Mr. Phillips has been District Engineer for the Geological Survey. Kenneth Phillips is a charter member of the Geological Society of the Oregon Country and served one year as its president, as well as serving on various committees at different times. In 1921 he was married to Miss Florence Hunter of Albany, Oregon. They have two daughters - Mrs. Merritt Cootes of Karachi, Pakistan, and Mrs. Peter Ford of Portland, Oregon - two granddaughters, Anne Carol and Bronwyn Ford, and one grandson, Marcus Ford. Mr. Phillips is a member of the Mount Tabor Presbyterian Church, the Mazama Club, the American Society of Civil Engineers, and the Geological Society of the Oregon Country. Harold Bruce Schminky was born in Woodbury, New Jersey, February 18, 1897, the son of Harry Newton and Alice Sidney Schminky, both of whom were born in Gratz, Pennsylvania, His parents moved to Reading, Pennsylvania, and from there came to Portland in 1905 to see the Lewis and Clark Fair. In 1909 they visited Seattle for the Alaska, Yukon and Pacific Exposition. By this time the lure of the West had become too strong to resist, and after looking around in both Seattle and Tacoma for a suitable business location, they came to Portland, and remained in Oregon from then on. Bruce attended grammar school in Pennsylvania, California, Colorado, Washington and Oregon, graduating at Sandy, Oregon, in June 1912. He spent his first year of high school at Sandy and completed the last three years at Washington High school in Portland, from which he was graduated with the class of June 1916. He entered Oregon State College, where he majored in Highway Engineering, and received his degree of Bachelor of Science in June 1920. The summer after graduation he began work with the late John H. Lewis, consulting engineer, and former State Engineer, on a proposed irrigation project on the John Day River. This work took him over much of the northeastern corner of Oregon, besides most of the John Day canyon. It was then that he came to love the rugged beauty of the eastern part of our state, but at that time he was not aware of the fossils and minerals to be found there. In February 1922 he entered the employ of the Department of Public Works of the City of Portland, where he still works. On December 23, 1922, he married Ruth Adelia Brown, a graduate of the Oregon College of Education at Monmouth. They have two daughters, Carol Ann and Alice May. The Schminkys are charter members of the Oregon Agate and Mineral Society, and became charter members of the Geological Society of the Oregon Country at the organization meeting held in Lincoln High School on April 18, 1935. They are Republicans and Presbyterians. 1935 Member of the Exploration (trip) Committee; on August 8, 1935, was appointed trip chairman by the Executive Board, following the resignation of Harry Clark, the first chairman. 1937Curator of Maps; member of Exploration Committee. 1938Chairman of Publicity Committee; Chairman of Wallowa Summer Camp Committee; member of Research Committee; Associate Editor of News Letter. 1939Vice-president; Chairman of Coos Bay Summer Camp Committee; Associate Editor of News Letter. 1940 Chairman of Trip Committee; Associate Editor of News Letter. 1941 Member of Annual Banquet Committee; Associate Editor of News Letter. 1942President; Associate Editor of News Letter. 1943 Director: Chairman of Publicity Committee; Associate Editor of News Letter. 1944 Director; Chairman of Trip Committee; Chairman of Annual Banquet Committee; Associate Editor of News Letter. 1945 Associate Editor of News Letter; Chairman of Trip Committee. 1946 Elected to Fellow in the Society; member of Annual Banquet Committee. 1947 Chairman annual Banquet Committee; Associate Editor of News Letter. 1948 Associate Editor of News-Letter; member of Annual Banquet Committee. 1949 Chairman Nominating Committee; Associate Editor of News Letter; member of Annual Banquet Committee. Lloyd L. Ruff was born August 6, 1905, on a farm in Ness County, Kansas. He attended rural school through nine grades and in 1925 was graduated from Ness City High School, where he participated in one year of debate, two years of football and two years of track. Until coming to Oregon in September 1928 he worked on farm and as helper-clerk for the Santa Fe Railroad. From 1928 until 1932 he attended the University of Oregon at Eugene, from which he was graduated with a B.S. degree in geology, and to which he returned as graduate student in geography and anthropology, and later as instructor in geology. He left the University in 1938 to accept a position as geologist with the U.S. Corps of Engineers and is now (1951) head of the Geology Section in the Engineering Division of that agency in Portland. Mr. Ruff is past chairman of the American Institute of Mining and Metallurgical Engineers; a member of the Geological Society of America and the Oregon Academy of Science; past president of the Oregon Agate and Mineral Society and the Oregon Numismatic Society; also a member of the Condon Club and Sigma XI. He is Curator of Geology of the Oregon Museum of Science and Industry and a member of its Board of Trustees. He also holds membership in the Oregon Stamp Society and the Oregon Archaeological Society. Mr. Ruff was married on January 13, 1940, to Margaret Shaw of Portland, Oregon. They have two children, Judith Ann and David Alan. E. Newton Bates, the tenth President of the Geological Society of the Oregon Country, was born on a farm In Dorr Township, Allegan County, Michigan, in 1879. He lived on the farm until his father, after whom he was named, went into the general country store business in the neighboring small town of Moline, which is located fifteen miles south of Grand Rapids on the Pennsylvania Railroad. While working in his father's store he developed a small bicycle repair business and he was the "trouble shooter" for the Citizens Telephone Company, which maintained a country telephone exchange in his father's store. He spent two years in the college preparatory department of Olivet College, Olivet, Michigan, and completed one year in the scientific course of the college. He then changed to the Michigan State College at East Lansing, from which he was graduated in Mechanical Engineering in 1906. In 1913 he was granted an M.S. degree from Michigan State College. After graduation he accepted a position as instructor in physics at the college, and three years later a position in Boston, Mass., with the engineering firm of D.C. and William B. Jackson. While employed in Boston he married Miss Cora L. Brown, a girl from his Michigan home town. The Bates's next moved to New York City, where E.N. was employed as draftsman in the construction department of the Standard Oil Company at 26 Broadway. In 1912 they moved to State College, Pennsylvania, where Mr. Bates was assistant professor in mechanical engineering. In 1918 Mr. Bates resigned his teaching position to accept a position as scientific assistant with the U.S. Department of Agriculture. This proved to be his last change of employers, but by no means his last change of address. In 1920 he was transferred to Portland, Oregon, to take charge of the office of Grain Investigations for the Pacific Coast. One of the duties he assumed was to encourage the handling of grain in bulk instead of in sacks. Raymond L. Baldwin was one of his able assistants in this work while the office was located in Portland. In 1927 the office was moved to San Francisco with Bates in charge and its name changed to Office of Rice and Grain Investigations. Problems of efficient production, storing and marketing of rice were added to the other duties. After nine years in San Francisco, the office was discontinued and the Bates's were transferred to Portland in 1936 to be attached to the Pacific Coast Headquarters Office of Federal Grain Supervision to have charge of developments, maintenance and standardization of the mechanical equipment used in the Pacific Coast Grain Supervision Offices. Upon returning to Portland one year after the birth of the Geological Society of the Oregon Country his good friend Raymond L. Baldwin introduced him to that enthusiastic group of professional and amateur geologists. Mr. Bates says that his interest in the Society has centered more in the geologists than in geology. The great variety of beautiful rock formations attracts him more than their industrial use and the classification phase of the science. The Bates's have a daughter, Eleanor B., who is married and lives in San Francisco. Bates claims that Franklin Davis bamboozled him into accepting the nomination as president for the Society by telling him that every so often the Society was expected to elect a rank amateur to its highest office. Mr. Bates retired from Government service in March 1949 and in May of that year was awarded a medal for superior service, and was called to Washington, D.C., at government expense to accept the award.